The DuroData line has several outstanding features, such a full length, nickel plated metals with piano hinges, riveted to stiff, 200 ga. indestructo boards. Available in sheet sizes 11" x 14-7/8" (burst) and 14-7/8" x 11" (unburst) styles. DuroData I  Has a single metal hinge for front cover opening only and uses 10" nylong posts permanently attached to the back cover (not shown). DuroData II  Has double metal hinges for either front ir rear opening and uses 10" flexicable posts. Locking bars can be extended for hanging style file systems (blue binder shown in picture). 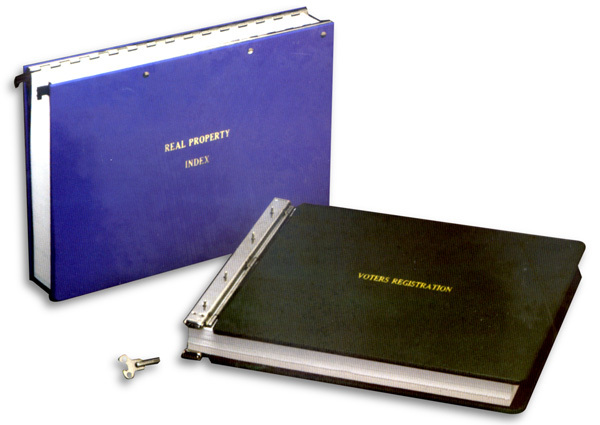 These Solid Post Endlock data binders are the ultimate in protection of valuable records (shown with key). 11" x 14-7/8" (burst) has four (4) 1/8" diameter posts, 2-1/2" - 3-1/2" - 1-1/2" centers. 2" or 4" cap posts. These data binders are economically priced for everyday storage and use. Availabe in 55 ga. poly material. All DataFlex binders have nickel plated channels and nylon posts. Poly available in Blue, Yellow, Black, Green Red and White. Available in most stock sizes. All DataFlex Binders are shrink wrapped in minimum package quantites of 10. Colors can be mixed to meet the package minimum. Options: Label Holders; Lettering; Indexes & Divider Sheets; Leather Corners; Blackflaps & Angle Backs. Note: DuroData and DataFlex Binders must have at least 1-1/4" of paper, in order to use angle backs.